A plateau streaked with meandering rivers, surrounded by the mighty Vindhya and Satpura hill ranges and some of the richest tropical forests anywhere. That's Madhya Pradesh. Sunny plains, orange blooms and the colourful, rustic, crinkly haired Bhils and the Gonds with their distinctive beliefs and customs, unchanged over centuries. That's Madhya Pradesh. An unique harmonious amalgam of ancient and modern. 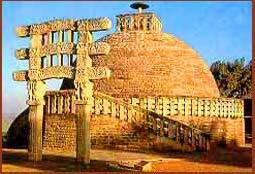 One of the oldest monuments in the history of Indian art - the 2200-year old Buddhist stupa at Sanchi-and the 20th century's contribution of Bhilai, the fast growing steel city. That too is Madhya Pradesh. The historic associations of Madhya pradesh go as far back as the 3rd century BC when Ashoka the Great laid the foundation of the Great Stupa at Sanchi- a popular Buddhist pilgrim attraction to this day. After him, the Sungas remained in power between the 2nd and the 1st century BC and it was during this period that the Great Stupa was enlarged and new structures added. Then came the Gupta Empire (300-510 AD)which brought about a vigorous resurgence of art and culture- giving us a legacy of murals and sculpture, temples and monuments. And, after that, a succession of kings came and went, each leaving his own imprint on the region. 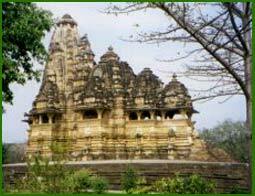 The thousands of fascinating monuments in central India are full of romantic and heroic legends. Each monument speaks eloquently of its tale. The exquisite carvings at Sanchi, the stupendous fort at Gwalior, the superb paintings at Bagh, the remains of an ancient civilization at Bhimbetka make one ponder over the mysterious past. The medieval Afghan capital of Mandu, scarred by sun, wind and battle still stands with its formidable fort and imposing mosque. Marvel at sculptors' expression of love in stone at the glorious Khajuraho temples. Get into the interiors of central India and you hear the lively beat of the colourful Maria drummers. It's fascinating to watch them with their bison-horn masks and feather crowns swinging to aboriginal martial tunes, just as their forefathers did thousands of years ago. Elsewhere you'll find the ancient pre-Aryan tribes, the Bhils and the Gonds. They still practise their medieval traditions, follow their distinctive customs in their remote retreat. Madhya Pradesh is a world of unique handicrafts. The delicately woven Chanderi and Maheshwari saris, Gwalior carpets, Mandasur blankets, hand printed silk and cotton, intricate gold and silver embroidery, leather and bead handbags, dazzling lacquer work, cigarette cases of Jabalpur soapstone... the list is endless. Like elsewhere in India, the best season to come to Madhya Pradesh is September-March.